PASCAGOULA, Miss., Feb. 24, 2011 -- The U.S. Navy accepted Northrop Grumman Corporation's (NYSE:NOC) latest Aegis guided missile destroyer today in a ceremony held on the fantail of the Navy's newest ship. William P. Lawrence (DDG 110) is the 28 th DDG 51 Class destroyer built at the company's shipbuilding operations in Pascagoula. William P. Lawrence will be commissioned later this year in Pensacola, Fla.
"This ship was the most complete going to trials and it by far performed the best during those trials," said U.S. Navy Capt. Bill Galinis, supervisor of shipbuilding, Gulf Coast. "Across the board, this ship scored 15 to 20 percent higher than any of the previous DDGs. 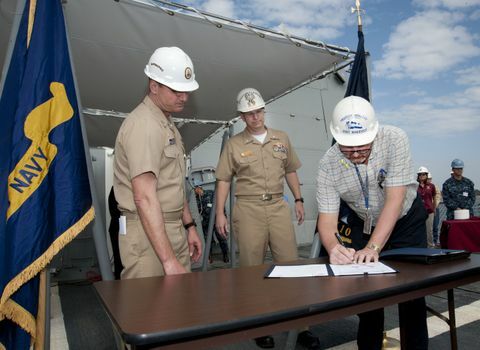 And that speaks volumes for the work that was done by the Shipbuilding/Navy team." U.S. Navy Cmdr. Thomas R. Williams, is the ship's first commanding officer and will lead a crew of over 300 officers and sailors. The 510-foot, 9,500-ton William P. Lawrence has an overall beam of 59 feet and a navigational draft of 31 feet. Four gas-turbine propulsion plants will power the ship to speeds above 30 knots. "The story of Adm. Lawrence is inspiring," said Cmdr. Williams. "It inspires me and my crew to strive for greatness every day. When we leave this shipyard, we don't know what the world has out there, but I know this ship is our home. This is the Navy's best crew. And we won't let down the shipbuilders, the men and women of Northrop Grumman, and the American people when we leave the shipyard. We will never ever give in. " DDG 110 honors the late Vice Adm. William P. Lawrence, who spent nearly six years as a prisoner of war in North Vietnam. He later served as superintendent of the U.S. Naval Academy.